High-performance monitoring solutions that give accurate, stable readings. Easy-to-use software and minimal maintenance provide hassle-free measurements for a wide range of applications and system integration options. With the new optional pump and display, just power the instrument on, and measurements appear immediately. View real-time measurements, configure graphs, or set up logging options with the easy-to-use software. 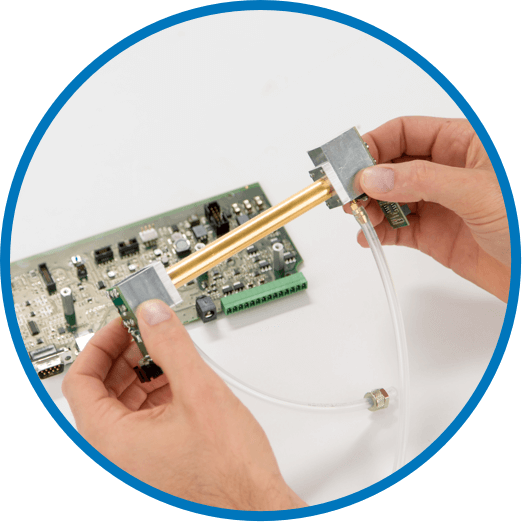 Ensure continuous operation and minimize downtime with a user-cleanable optical bench, and no need for factory recalibration. Windows® and Mac® interface software display real-time concentrations and graphs. 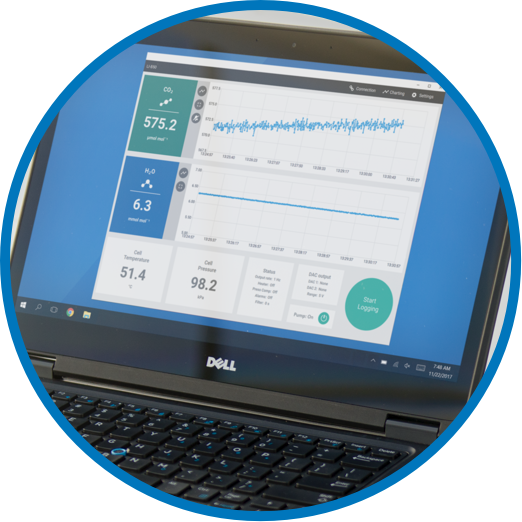 Easily set up operational parameters and logging options, and view analyzer diagnostics. Flexible to Fit Your Needs. Multiple configuration options provide you the flexibility to select the analyzer that’s right for you, without compromise. Add water vapor measurements to the standard CO2 measurement (0-20,000 ppm) for expanded applications and increased measurement accuracy. An integrated pump provides a constant air flow rate. Or, choose a basic analyzer configuration and incorporate your own pump. Add a display to view real-time gas concentrations, and pressure and temperature readings. Flexible configurations and outputs for a variety of applications. 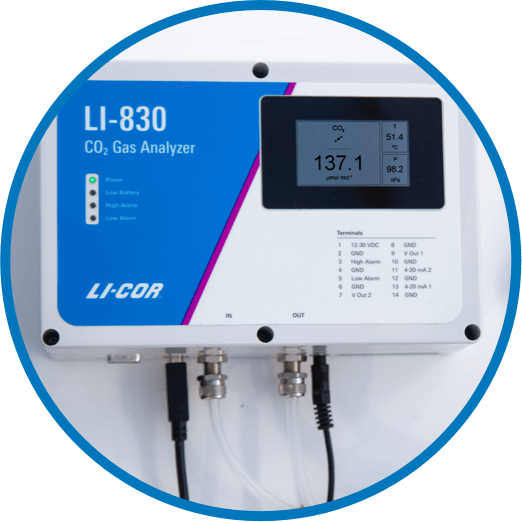 Analyzers can be configured to monitor CO2/H2O and trigger fans or injection of CO2 and/or H2O, keeping levels within a desired range. User-supplied relays can also trigger devices such as pumps, valves, dialers, or audible alarms. Analyzers have the stability and durability to continuously monitor atmospheric CO2 and H2O. The included software facilitates configuration, control, data collection, and graphical data display. Advanced Technology for Excellent Performance. Careful design of thermostatically controlled IR detection system gives you excellent stability. Integrated thermistors and a pressure transducer provide high accuracy for the concentration calculation over the entire measurement range. A pressure transducer within the gas flow path compensates, and corrects for, changes in barometric pressure. A foam enclosure surrounding the optical path maintains a controlled thermal environment and protects the bench from mechanical shock and vibration. Output What’s Right for You. The Analyzer You Trust – Now Even Better, at a Lower Cost. We’ve improved upon our proven platform, to bring you better analyzers with the performance and reliability you’ve come to trust. 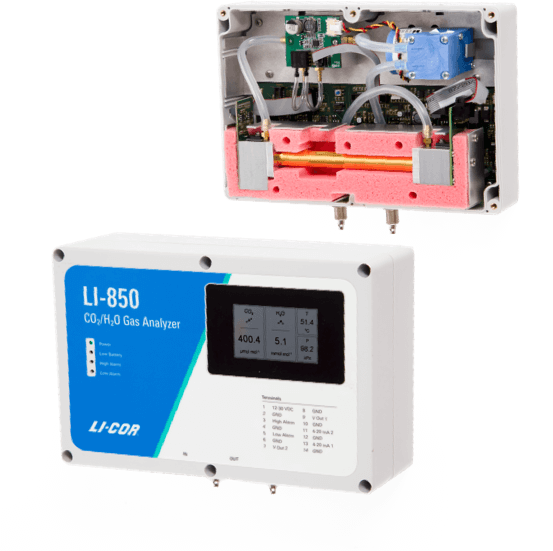 In addition to expanded configuration options, the new LI-830 CO2 and LI-850 CO2/H2O Analyzers also feature a longer lasting source - further minimizing any field maintenance needed, with lower power requirements. Displayed variables: CO2 reading, H2O reading (LI-850 only), optical bench temperature, and pressure. Zero drift is the change with temperature at 0 concentration. Span drift is the residual error after re-zeroing following a temperature change. Total drift is the change with temperature without re-zeroing or re-spanning.